Do you know about the File & File Systems? File is a collection of related information. It is stored on the secondary storage area. File system is used to properly stored, modify the file. Without a file systems, we are not able to properly identify, manage or store files. In this article we have to discuss about the file systems and his types. 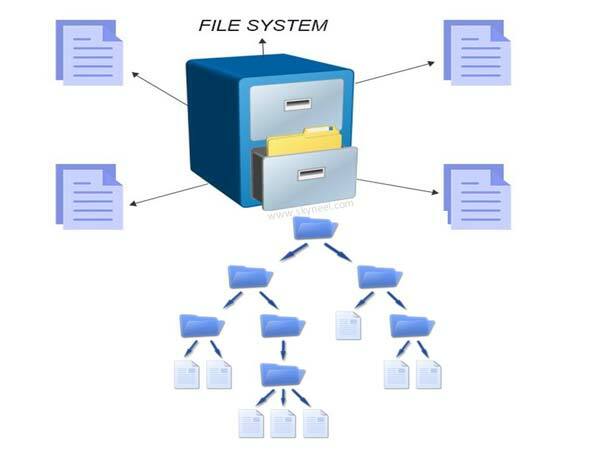 You can also know how file system works in the operating systems. Each piece of information is called a file. There are different types of file systems. File systems basically classified in FAT16, FAT32 and NTFS files systems are accessible in Win XP. VFAT and HFS are also accessible. This type of system is used in MS-DOS (Microsoft Disk Operating System) in 1981. It is compatible on different platforms like Windows 95, Win98, WinME, Linux, OS/2 and Unix. It’s cluster size in 32 KB in a 2 Gigabyte. It doesn’t support compression, encryption, or advanced security. This kind of file system is runs on Win95 SP-2. It runs on Windows NT, Unix and Linux platforms and also share your hard disk drive data to other computers in a network. It is a substitute of the File Allocation Table file system which is accessible in Windows 95 and Windows NT 3.5. VFAT stocks additional info. in the directory that oldest Disk Operating System and Operating System/2 systems can ignored. Thee HPFS file system worked in Operating System/2 and sustained by the Windows NT. It support long file names, provide much better presentation than FAT. NTFS means Network File System and is launched in Windows NT. It provide great security, compression of files, and many more. You can easily convert your old file system with NTFS file system during upgrading process. Ext2 means “Second Extended File System”. developed by the Rémy Card in 1993. Highest single file size is 16 Giga Byte to 2 Terabyte. Complete ext2 file system size can be from 2 Tera Byte to 32 Terabyte. Ext3 means “Third Extended File System”, developed by Stephen Tweedie in 2001. It was starting from Linux Kernel 2.4.15 ext3. Due to the journaling When the system crashes, the chances of system corruption is much lesser. Highest single file size is 16 Giga Byte to 2 Terabyte. Complete ext3 file system size can be from 2 Tera Byte to 32 Terabyte. You can convert an ext2 file system to ext3 file system straight without any backup and restore. There are three types of journaling in the ext3 file system. Journal, Ordered and Write back. Ext4 means “Fourth Extended File System”, developed in 2008. Given file systems available in the Linux Kernel 2.6.19. Highest single file size is 16 Giga Byte to 16 Terabyte. Complete ext4 file system size is 1 EB. You can create at least 64,000 sub directory in a directory using this system.